This off road buggy's got bite! RADLINE RC's FANG is designed to perform and excite with high quality components and slick, serpentine looks---right out of the box! 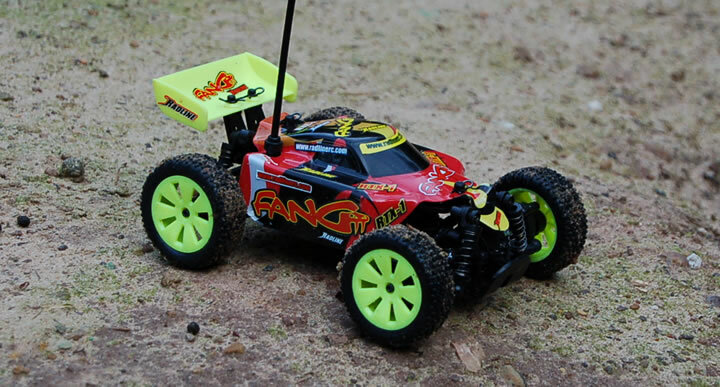 What's got more bite than RADLINE RC's FANG Racing Buggy? This AWD, all-terrain buggy is chock full of venom - and equally comfortable on or off-road. It's versatile, quick, and with RADLINE's durable chassis, independent wishbone suspension and specialized tires and wheels, the FANG can take a beatin' and still keep kickin't! Your complete RADLINE RC FANG Race Kit also includes batteries, a racing spoiler, bumper, decal set and 2 Channel TX controller. Still not enough excitement for you? "Modify and Maximize" your FANG with optional RADLINE RC performance parts and accessories!